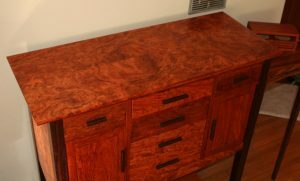 Around 2010 I built a sideboard using highly figured Bubinga. I was still in my experimenting with finishes stage. The top was too shiny for my taste, but I left it that way for a long time. Finally, I decided to refinish the top more to my liking. Removed the top and sanded with 50 grit paper and proceeded through grits to 220. The original top also showed planer snipe at one end which was only visible in certain lighting angles. The sanding also removed the snipe. Thank you, very much. Finished with usual varnish/BLO/mineral spirits wipe on/wipe off procedure. Besides being more to my taste, I removed the wince that would cross my face every time I looked at that piece. In response to Shawn’s query I looked at the original photo gallery (and the actual cabinet). Flipping through the images I see a number of processes that no longer fit my style. The hollow chisel mortiser is gone. Replaced that process with either uncut spiral bit in the router (with edge guide) or by hand with mortising chisel. I do not use a pattern router bit on curves any more. These days I’ll cut close to the line on band saw (as before) and then shape with planes, spokeshaves, rasps and sandpaper. I do not ever expect to use the hidden Soss hinges again. They caused all sorts of issues. My solutions created rather weak stiles on the hinge sides as I had to round them over to gain clearance. These days I would use knife hinges. Shawn asked of rationale for not using secondary wood for non-visible portions such as the case top (buried below the show top). I had enough of the fabulous Bubinga for the show top, sides, drawer fronts and door panels. “Regular” (but still nicely colored and patterned) material for the rest. Pure indulgence. For instance, the sides are built to 1-1/2 inches thick from the figured material on outside and regular, but lovely material, on the inside of the sandwich. That is hidden below the top (above) and the legs (front view), but it was fun to do it that way. The inside surface is visible when you have the door(s) open. Interestingly the hardwood dealer (Soboba) charged the same for the highly figured material as the regular Bubinga. When I saw it in his shop, I immediately got out my checkbook without a specific use in mind. 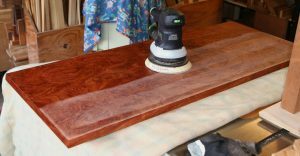 I used Philippine Mahogany for top row of drawer runners (aka web frame). Also used P.M. for drawer sides and bottoms as well as the back ship lapped back slats. 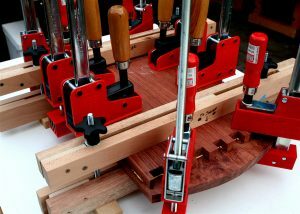 Legs of Padauk. Hey Tom, good on you for taking the top to make this look the way you want. 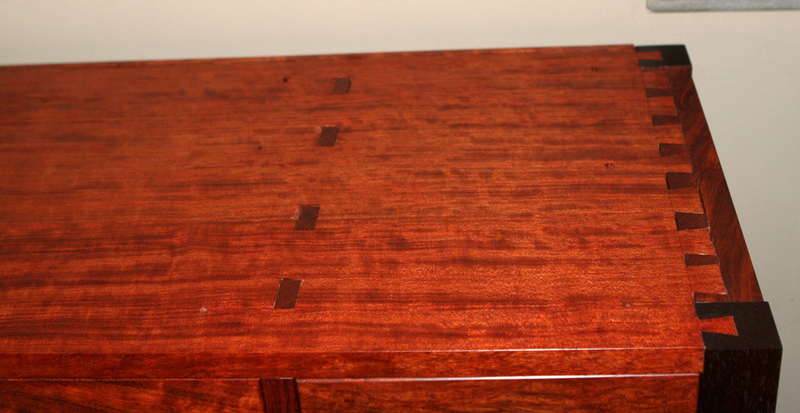 One question: did you use curly bubinga on the dovetailed top and then bury it beneath another curly bubinga top? Just curious why you didn’t use a secondary wood for that part. Hi Shawn, In general I’d rather make new than “repair” existing, but on occasion I will take care of issues that bug me. The post has been expanded to address your query.